If you are a sci-fi fan of any sort, or a reader of fine Christian novels, then there is one that I highly recommend you get your hands on. 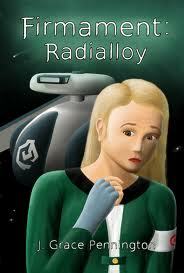 The debut novel of Grace Pennington, Firmament: Radialloy—part one of an eighteen book series that follows the second medical officer aboard the ship Surveyor in the year 2320. Andi Lloyd has lived with her caretaker, Doctor Lloyd, as long as she can remember. Having been in space for half her life, the Surveyor has become her home. All was well, until one day her home is threatened. Secrets from her past—a past that she can’t remember—begin to emerge and suddenly her world is shaken. Suddenly the doctor is taken ill with a mysterious disease that is slowly causing him to lose his mind, mutiny breaks out and on all sides she is surrounded by people who are after something not even she knows about: the deepest secret from her past. In the face of this, Andi must solve the mystery of her past and save the doctor…but time is running out. For all the sci-fi books out there, you probably know the plot and ending of most of them. Typically they are shallow and only filled with relentless action and very little character—Pennington breaks that mold completely with her new series. She instead builds this fantastic cast of characters that make up the ship Surveyor, from the Doctor, Andi, Crash, Guilders, Captain Trent, and August, each one makes a unique impression as you read, fleshing out this futuristic world of starship travel. But probably one of the most impressive parts of this novel is that it has a detailed and layered plot. This is not a mindless romp into space—it’s a mystery, and a darn good one. As each little piece comes to light (bit by bit, so it keeps you riveted) the story begins to unfold, and grow more captivating with each new discovery—sure to keep you fixed until you finish it. As a self-professed Trekkie, (see her author interview here on ItB) Pennington operates in that familiar and interesting environment with a bit of a twist: a faith-based worldview. One of the most interesting aspects of this plot is not just the mutiny, or the mystery of Andi Lloyd’s past—but her struggle to get through it by leaning on her faith. This is something missing from the great majority of Christian fiction in our day, and one that has enriched this book so much. Andi’s interaction with God, and the reality of her faith is in a way part of the backbone of the book, because it’s also the backbone of the main character. She stands in the face of danger only by her faith in God. Though her faith is challenged in the book, it is not really shaken—and it is not in vain, for God is always faithful, He never forgets His own. So, as a sci-fi fan myself, and as a particular admirer of the Battlestar Galactica, and Star Trek (TNG, but don’t hold that against me) variety, this series fell right into my favorite side of the sci-fi genre—but as a reader and as a Christian this definitely hit home with me. Highly enjoyable characters, smart dialogue, intriguing writing and a plot that burns with mystery and faith makes this book is for sure a winner and I highly anticipate the sequel in this already “out of this world” series. Oh…one of those! 😉 Glad you enjoyed it.